decorative, placed to define the end of the driveway? We did not think much of it, but when looking at the property we had decided it would be something we would remove early on. Before even giving them a thought we decided it was not our style. Once we moved in we had a lot of projects that took priority over the wagon wheels, like getting rid of wood piles covered in tarps and changing out the carpeting that looked original, and of course exploring the lake with the kayaks and boats. We decided to make sure we had plenty of fun time, after all we did not move to the lake to be working all of the time. We knew some projects could wait. Well it was good that we waited because time changed our attitude on those wagon wheels. and the surrounding area). In fact the road we live on alone has four different properties with wagon wheels. 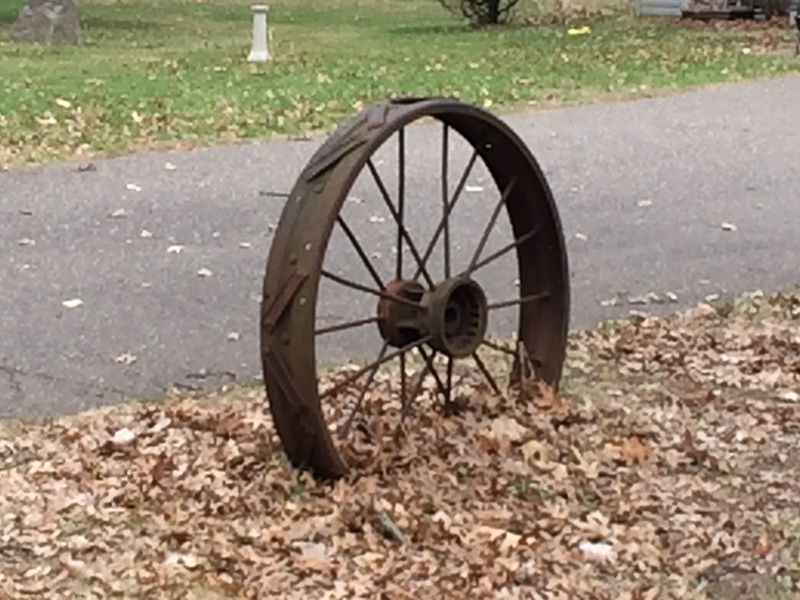 Along County Hwy 22 our nearest large road, there are a number of properties with wagon wheels, and when we explored the side streets on our four wheeler, we started to notice even more wagon wheels. So many, that it sparked our conversation and curiosity. Why so many wagon wheels? 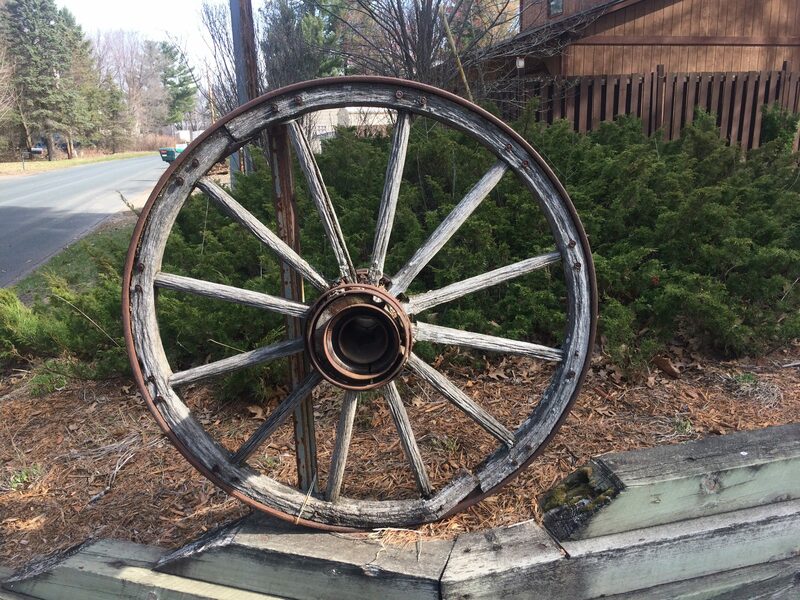 What is the deal with all the wagon wheels in East Bethel? 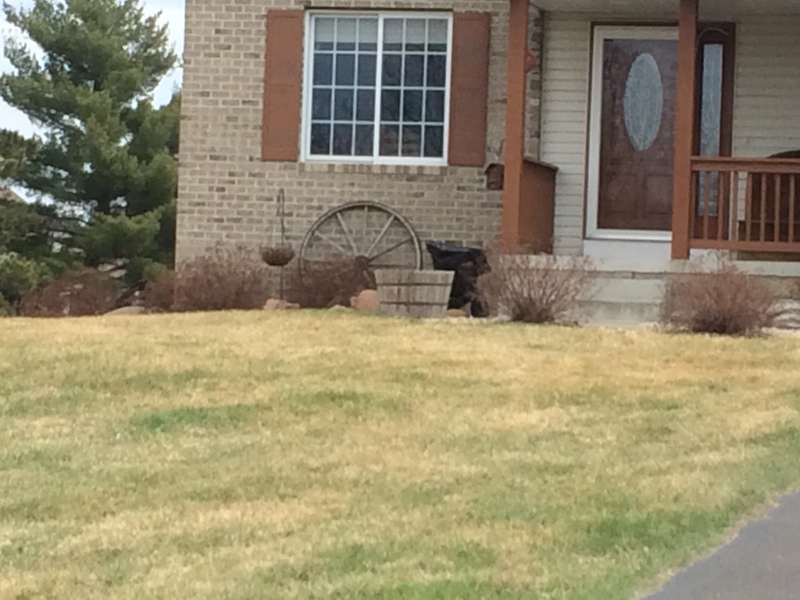 I had lived in Blaine for 25 years, I’ve lived in Duluth and St. Paul, and I grew up in Pierz, Minnesota, but I have never seen so many wagon wheels in landscaping and displayed proudly as in East Bethel. I have traveled many times out west where the wagon trains were mostly headed. I did not see as many wagon wheels out west as I have seen here either. 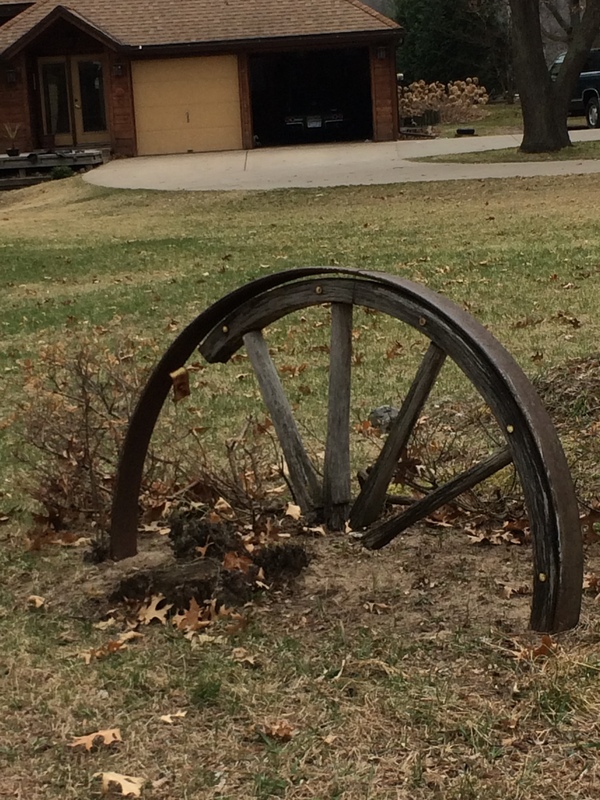 It made me ponder, especially while relaxed and walking my dogs around the neighborhood, what do these wagon wheels represent? Over 150 years ago, families packed up their entire life into a wagon and set out on an adventure to find a better life. I cannot imagine the contemplation and decision making that preceded the actual move. The couples discussing whether the danger of the trek would be worth the reward of open land for homesteading that waited at the other end. They had a chance, not only at a new life, but a better life. They had to be sure that their wagon, with its strong wheels, could carry them the entire way over mountains, through endless prairie grass and crossing treacherous rivers. The trust, hope and bravery that must have gone into that decision is almost unimaginable today. We even contemplate fun trips with some apprehension, and we have the internet to see every detail of where we are going, photos of every location we are going to, and we can read reviews on anything we are interested in doing. The amount of information we have to make simple decisions is endless. The lack of information that the wagon train generation had available to make life and death decisions are mind-boggling. Yet they had faith, trust, hope and an adventurous spirit that they would handle whatever life threw at them, because they were striving for a better life for themselves and for their children. I would like to think that had I lived in the time of wagon trains, I would have been brave enough to load that wagon and see what the horizon brought. I would like to think I would have been selfless enough to know that making the decision would benefit my children and grandchildren more than me and making things better for my family would have been a driving factor. Of course I cannot help, but reminisce back to the 1990’s when our kids and I played the computer game called, Oregon Trail and our entire family died every second game of either dysentery or we corked our wagon to forge the river and everyone drowned. As depressing as that sounds, it was a really fun game. It was challenging to see if one could get to the destination, and when we did without killing off the entire family, we had a sense of accomplishment until we started back at the beginning again and then lost everybody. We had a lot of fun with that game, but the game hit home the realities of the real dangers the wagon train generation faced in making the decision to go. They lost about half their babies and their small children many times could not tolerate the disease and hardships. They were many times hungry and scared. I imagine myself as a mom, worrying about whether we would have enough food along the way for the family, worried and watching my kids for fever or the other dangers of the road like broken bones or encounters with wild animals. Of course the whole time also dreaming and hoping that we find our little piece of heaven on earth at the end of the long trek. 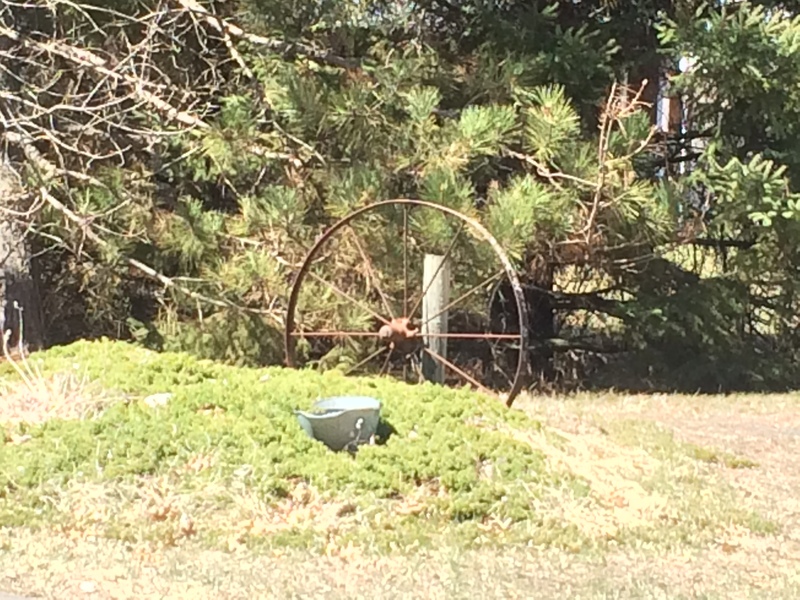 Why there are so many wagon wheels displayed in our area of East Bethel, I do not know. I know the area had a lot of Swedish settlers back in the day, but I am still in search of why so many wagon wheels survived and are so prominently displayed today here in this area of the county. I know I do not look upon these wheels in the same way anymore. I can tell you that these wagon wheels have a whole new meaning for me. They represent bravery and change. They represent hope, hard work and a promise of a better and more fulfilled life. I look upon them and remember the adventurous souls who were brave enough to change everything for the hope of something new and to trek into the unknown to find it. The wheels inspire us to explore and to take chances and to always hope and look to the future and move forward. They represent courage for the unknown and strength in the face of fear. I am keeping my wheels as long as they hold together. As I drive in and out of my new lake place, a place my husband of 30 years and I bought to start our new empty nest life together, I am inspired to keep up the adventure, hope and spirit of the past, while looking to the future adventures that life will bring us.